For the past several years Breyer has offered a "surprise" model as one of the limited edition special runs. The model is sold wrapped in bubble wrap and an opaque bag, so you don't know what you got until you unwrap it. #4: Grey and white pinto with loose mane and full tail. There are a total of 2000 models, *probably* 500 in each color, however some are glossy and some are matte. Exact numbers of each are unknown right now. 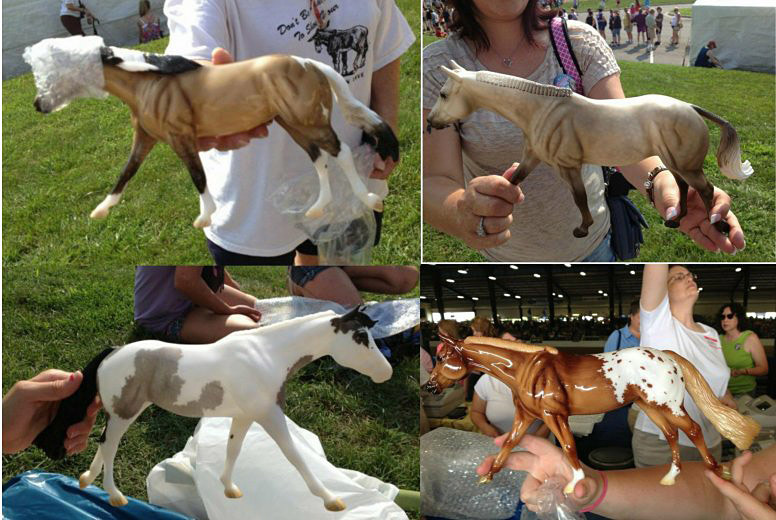 To buy one of these models, try searching the Model Horse Sales Pages, or eBay. Breyerfest 2013 Special Run CC SHUFFLE Matte Dapple Grey *Roxy Mold* LSQ!